In our body's intestinal system, the Small Intestine located in the abdominal cavity is the portion of the gastrointestinal tract between the pylorus of the stomach and the ileocaecal valve of the large intestine, contains the three subdivisions of: the beginning with duodenum (most proximal 9.8 in. long), followed by the jejunum (which begins the lower gastrointestinal tract) 3-6 ft. long, then finally the ileum (most distal 6-12 ft. long), ending at the ileocaecal junction (ileocecal sphincter). In our body's small intestine, the Jejunum in the middle small intestinal section between the duodenum and the ileum is the beginning of the lower gastrointestinal tract. 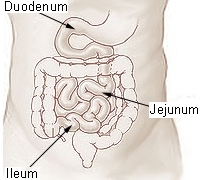 In our body's small intestine, the Jejunum changes from from the duodenum to the jejunum is defined at the ligament of treitz. In and on our body, Brush Border Cells (Brush Cells), as cell surface extensions, are the microvilli-covered surface cells of some simple cuboidal epithelium and simple columnar epithelium cells, found in the kidneys, intestines and elsewhere. In our body's intestinal system, Intestinal Brush Border, is the Cells containing microvilli (tiny hairs) used for absorption, secretion, adhesion etc. In our body, the Brush Border is a collection of microvilli forming a border on the intestinal side of the epithelial cells of the small intestine. On our body's cell membranes, the Microvilli, as cell surface extensions, are the minute hair-like projections on the surface of the epithelial cells of the villi which greatly increase the surface area of the cell. In our body's intestinal system, the Microvilli in the small intestine increase the surface area of the intestine which improves absorption of digested nutrients.